The beautiful municipality of Grünbach lies in a diverse region of southwest Saxony in the middle of the Vogtland. 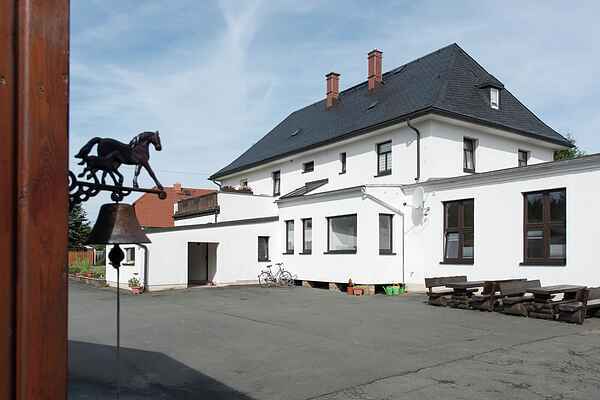 Its proximity to Thuringia, Bavaria, the Ore Mountains and the Czech Republic is particularly noteworthy. The surroundings offer numerous possibilities for a relaxing and active holiday both in the summer and winter. Enjoy a relaxed atmosphere right by the forest. The cosy apartment is located on the ground floor. The house is located on an equestrian farm with a private riding hall, riding lessons, guided horseback rides, carriage and sleigh rides. The well signposted hiking and riding trail network starts right on your doorstep. In the winter you only have to walk 200m to reach the cross-country skiing trails. There is a nice hotel with an indoor swimming pool, sauna and restaurant right across the street.